China has taken an assertive view when it comes to entering into Double Tax Agreements (DTA) with other nations – it now has 99 such treaties, many of them recent. This compares with the United States, who has 67 such treaties (including with China), but of which many are seriously out of date and written prior to the contemporary internet age. As a result, many of the American treaties are insufficient when it comes to dealing with IT and communications. China’s DTAs tend to be rather more sophisticated by virtue of them being more contemporary. China’s leadership, in effect, have been far more savvy than their American counterparts when it comes to positioning the country as tax friendly in the IT, software and communications industries – curious given that the U.S. is a major innovator in this exact same arena. DTAs are useful as they enshrine within the bilateral agreement the treatment of many forms of tax – including corporate income tax, individual income tax, withholding taxes and dividend taxes amongst others. They are useful not just for companies that have a presence in both nations, but also for trading companies that may not have a permanent presence but who may be charging services to a China-based entity. Such services are typically chargeable (withholding tax) – and effective use of the applicable DTA can halve this burden. Yet, as in the case with China’s Free Trade Agreements, the legal and tax professions are effectively split in China, and because of this not many law firms possess knowledge of DTAs, and consequently ignore them when structuring foreign investments into the country. This is problematic as the identification of, and the ability to utilise, applicable DTAs should often be catered for within the articles of association – as well as be negotiated up front with the relevant tax officials in China. Failing to do so can result in tax overheads that are far more than they ever needed to have been. That said, the situation can be retrieved – but only through firms both qualified to do so and with an understanding of China’s regulations from both the legal and the tax perspective. China has always been a tax structural play for foreign investors at the start-up stage. Attention to detail needs to be paid so as not to miss out on bilaterally negotiated benefits that can be highly beneficial. China charges a 10 percent dividends tax upon profit repatriation overseas, in addition to a 25 percent corporate income tax (CIT). Many DTAs provide for a clause that reduces the dividends tax portion by 50 percent. Withholding Tax (WT) is charged on an array of service fees billed by a company in its home country to a company (which could be either a client or a subsidiary) in China for the service the former provides to the latter. As profits tax cannot be charged to a company that is non-resident, WT takes its place. The amount of WT varies considerably depending upon the service provided. Interested businesses should check with their advisors as to what the applicable rate per service is. However, as a general rule of thumb, it is normally between 10-20 percent of the total invoice value. DTAs can in many cases halve this amount. Services charged by the parent for use of royalties for trademarks by its own subsidiary, for example, may be remitted to the parent at a lower rate than the 10 percent withholding tax levied in China. While Chinese foreign-invested entities can sign a variety of service agreements with foreign companies, including with their headquarters (HQ), these agreements can sometimes be looked upon with suspicion as ‘constructed channels’ for sending money between HQ and their subsidiary. It is important to bring the intent to use the DTA to the attention of the local tax office in China, together with copies of the DTA (in Chinese) with the articles of association and business license of the company. Permission is required by tax officials in China to reduce the amount of taxes due from the company and they need to provide an explanation to their own superiors. Accordingly, a well presented case needs to be made. It is advisable that this involve assistance from a professional firm in China qualified to assist. However the tax savings obtained typically outweigh the fee burden charged for the service. It should be noted that under the banner of WT, services and IP issues, such structures can become complicated, and there are additional rules to cater for fair and reasonable use over this. These rules come under China’s Transfer Pricing regulations, and may be referred to in our book on the subject here. 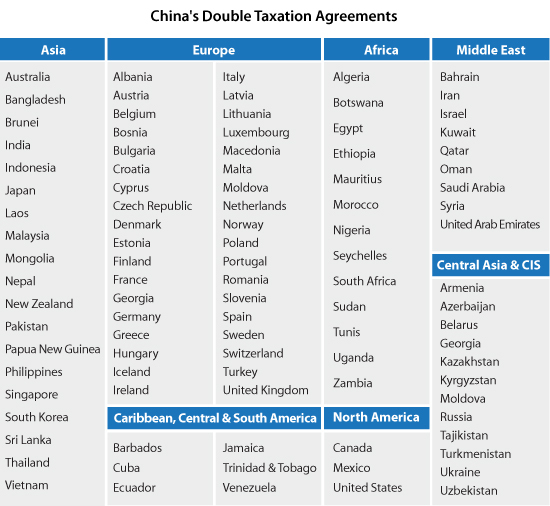 Where Can I Find China’s Double Tax Agreements? Examine any China tax registration processes that may require additional registration and advise them of your intent to invoke treaty status. This is a specific registration process in China. If you have not completed this process or are unsure, seek professional advice to remedy the situation. Even given fees, the tax amount saved will almost certainly cover them in year one alone. When completed, your business is DTA-enacted and will save on the varying taxes that would otherwise have been due. Chris Devonshire-Ellis is the Founding Partner of Dezan Shira & Associates – a specialist foreign direct investment practice providing corporate establishment, business advisory, tax advisory and compliance, accounting, payroll, due diligence and financial review services to multinationals investing in emerging Asia. Since its establishment in 1992, the firm has grown into one of Asia’s most versatile full-service consultancies with operational offices across China, Hong Kong, India, Singapore and Vietnam as well as liaison offices in Italy and the United States.